Ai Senshi Nicol (愛戦士ニコル, Ai Senshi Nicol?, lit. 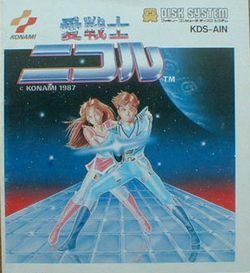 "Love Warrior Nicol") is a 1987 action game developed by Konami for the Family Computer Disk System. Nicole is a boy genius scientist hero, who develops the technology to move objects across dimension. A demon from the Dairasu star system intends to steal it for his own purposes and kidnaps Nicol's girlfriend Stella as part of his plan. The game consists of 7 stages. Within each stage, Nicol must locate three "Diamond Crystals." Once all three have been located, transformed, and collected, he may advance to the next stage. He can also collect other items throughout the stage that will increase his defensive and offensive abilities. His life gauge is displayed on the bottom of the screen, and if it is reduced to 0, it will be game over. You can continue or save the game. Many stages have gaps. If Nicol slips into them, he will fall down a shaft and arrive in a difficult zone from which it is possible to escape. But these zones, typically filled with lava, will drain him of a good deal of health. He will need to jump constantly to minimize the extent of the damage received, until he locates stairs that will return him to the place where he originally fell. When you return to screens that you've previously visited, all of the enemies return, with the exception of boss monsters. This page was last edited on 16 November 2013, at 23:38.